Home Business Analytics Kaggle Bike Sharing Demand Prediction – How I got in top 5 percentile of participants? Kaggle Bike Sharing Demand Prediction – How I got in top 5 percentile of participants? Type 2: Who aren’t experts exactly, but participate to get better at machine learning. These people aim to learn from the experts and the discussions happening and hope to become better with time. Type 3: Who are new to data science and still choose to participate and gain experience of solving a data science problem. If you think you fall in Type 2 and Type 3, go ahead and check how I got close to rank 150. I would strongly recommend you to type out the code and follow the article as you go. This will help you develop your data science muscles and they will be in better shape in the next challenge. The more you practice, the faster you’ll learn. And if you are a Type 1 player, please feel free to drop your approach applied in this competition in the comments section below. I would like to learn from you! 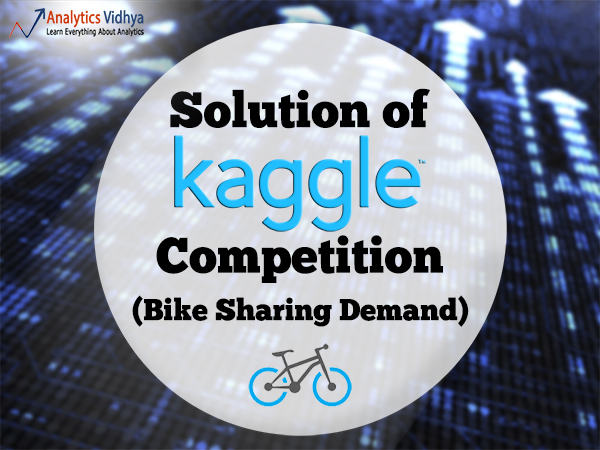 Kaggle Bike Sharing Competition went live for 366 days and ended on 29th May 2015. My efforts would have been incomplete, had I not been supported by Aditya Sharma, IIT Guwahati (doing internship at Analytics Vidhya) in solving this competition. Become proficient with any one of the language Python, R or SAS (or the tool of your choice). Identify the right competition first according to your skills. 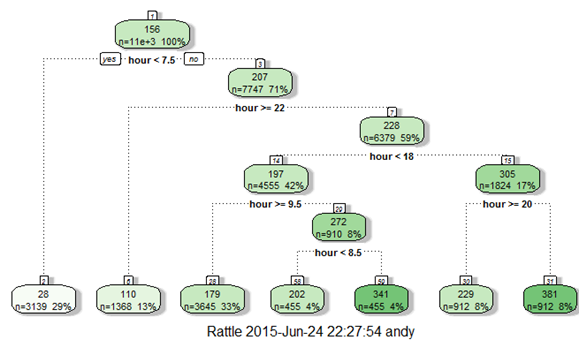 Here’s a good read: Kaggle Competitions: How and where to begin? In Kaggle knowledge competition – Bike Sharing Demand, the participants are asked to forecast bike rental demand of Bike sharing program in Washington, D.C based on historical usage patterns in relation with weather, time and other data. Using these Bike Sharing systems, people rent a bike from one location and return it to a different or same place on need basis. People can rent a bike through membership (mostly regular users) or on demand basis (mostly casual users). This process is controlled by a network of automated kiosk across the city. How does it help? This practice usually helps you form better features later on, which are not biased by the data available in the dataset. At this stage, you are expected to posses structured thinking i.e. a thinking process which takes into consideration all the possible aspects of a particular problem. Hourly trend: There must be high demand during office timings. 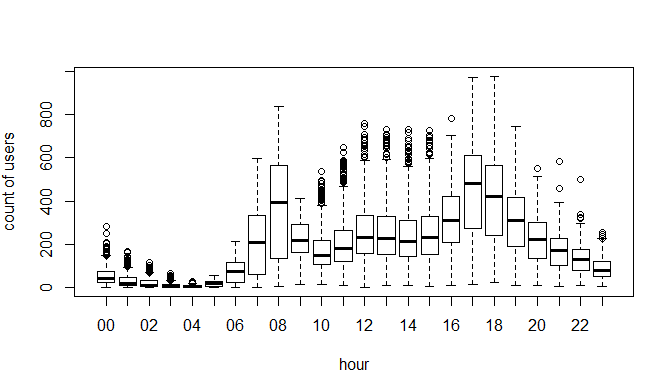 Early morning and late evening can have different trend (cyclist) and low demand during 10:00 pm to 4:00 am. Daily Trend: Registered users demand more bike on weekdays as compared to weekend or holiday. Rain: The demand of bikes will be lower on a rainy day as compared to a sunny day. Similarly, higher humidity will cause to lower the demand and vice versa. Temperature: In India, temperature has negative correlation with bike demand. But, after looking at Washington’s temperature graph, I presume it may have positive correlation. Pollution: If the pollution level in a city starts soaring, people may start using Bike (it may be influenced by government / company policies or increased awareness). Time: Total demand should have higher contribution of registered user as compared to casual because registered user base would increase over time. The dataset shows hourly rental data for two years (2011 and 2012). The training data set is for the first 19 days of each month. The test dataset is from 20th day to month’s end. We are required to predict the total count of bikes rented during each hour covered by the test set. In the training data set, they have separately given bike demand by registered, casual users and sum of both is given as count. Training data set has 12 variables (see below) and Test has 9 (excluding registered, casual and count). For this solution, I have used R (R Studio 0.99.442) in Windows Environment. Combine both Train and Test Data set (to understand the distribution of independent variable together). Before combing test and train data set, I have made the structure similar for both. Find missing values in data set if any. Above you can see that it has returned no missing values in the data frame. Understand the distribution of numerical variables and generate a frequency table for numeric variables. 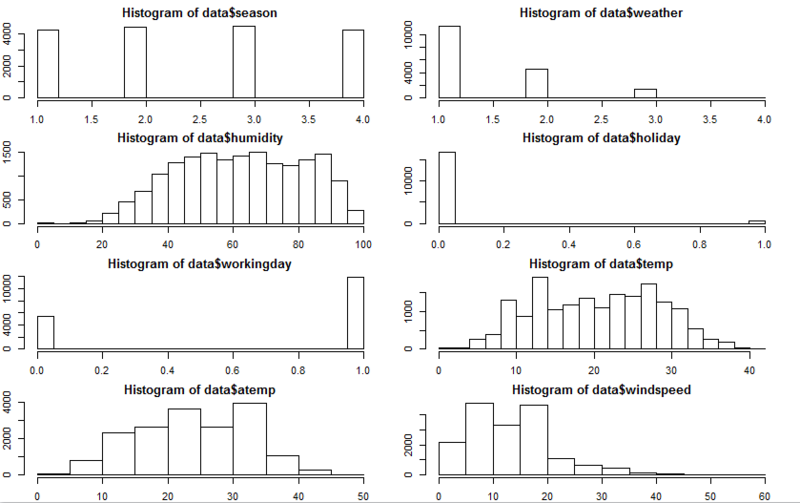 Now, I’ll test and plot a histogram for each numerical variables and analyze the distribution. Weather 1 has higher contribution i.e. mostly clear weather. As expected, mostly working days and variable holiday is also showing a similar inference. You can use the code above to look at the distribution in detail. Here you can generate a variable for weekday using holiday and working day. Incase, if both have zero values, then it must be a working day. Variables temp, atemp, humidity and windspeed looks naturally distributed. Hourly trend: We don’t have the variable ‘hour’ with us right now. But we can extract it using the datetime column. Let’s plot the hourly trend of count over hours and check if our hypothesis is correct or not. We will separate train and test data set from combined one. Here I have analyzed the distribution of total bike demand. Let’s look at the distribution of registered and casual users separately. Above you can see that registered users have similar trend as count. Whereas, casual users have different trend. Thus, we can say that ‘hour’ is significant variable and our hypothesis is ‘true’. You might have noticed that there are a lot of outliers while plotting the count of registered and casual users. These values are not generated due to error, so we consider them as natural outliers. They might be a result of groups of people taking up cycling (who are not registered). To treat such outliers, we will use logarithm transformation. Let’s look at the similar plot after log transformation. Daily Trend: Like Hour, we will generate a variable for day from datetime variable and after that we’ll plot it. Plot shows registered and casual users’ demand over days. While looking at the plot, I can say that the demand of causal users increases over weekend. Rain: We don’t have the ‘rain’ variable with us but have ‘weather’ which is sufficient to test our hypothesis. As per variable description, weather 3 represents light rain and weather 4 represents heavy rain. Take a look at the plot: It is clearly satisfying our hypothesis. Temperature, Windspeed and Humidity: These are continuous variables so we can look at the correlation factor to validate hypothesis. Variable atemp is highly correlated with temp. Time: Let’s extract year of each observation from the datetime column and see the trend of bike demand over year. You can see that 2012 has higher bike demand as compared to 2011. Pollution & Traffic: We don’t have the variable related with these metrics in our data set so we cannot test this hypothesis. In addition to existing independent variables, we will create new variables to improve the prediction power of model. Initially, you must have noticed that we generated new variables like hour, month, day and year. Hour Bins: Initially, we have broadly categorize the hour into three categories. Let’s create bins for the hour variable separately for casual and registered users. Here we will use decision tree to find the accurate bins. We use the library rpart for decision tree algorithm. library(rattle) #these libraries will be used to get a good visual plot for the decision tree model. Now, looking at the nodes we can create different hour bucket for registered users. Similarly, we can create day_part for casual users also (dp_cas). Temp Bins: Using similar methods, we have created bins for temperature for both registered and casuals users. Variables created are (temp_reg and temp_cas). Year Bins: We had a hypothesis that bike demand will increase over time and we have proved it also. Here I have created 8 bins (quarterly) for two years. Jan-Mar 2011 as 1 …..Oct-Dec2012 as 8. Day Type: Created a variable having categories like “weekday”, “weekend” and “holiday”. As this was our first attempt, we applied decision tree, conditional inference tree and random forest algorithms and found that random forest is performing the best. You can also go with regression, boosted regression, neural network and find which one is working well for you. As we know that dependent variables have natural outliers so we will predict log of dependent variables. Predict bike demand registered and casual users separately. y1=log(casual+1) and y2=log(registered+1), Here we have added 1 to deal with zero values in the casual and registered columns. #predicting the log of registered users. #predicting the log of casual users. After following the steps mentioned above, you can score 0.38675 on Kaggle leaderboard i.e. top 5 percentile of total participants. As you might have seen, we have not applied any extraordinary science in getting to this level. But, the real competition starts here. I would like to see, if I can improve this further by use of more features and some more advanced modeling techniques. In this article, we have looked at structured approach of problem solving and how this method can help you to improve performance. I would recommend you to generate hypothesis before you deep dive in the data set as this technique will not limit your thought process. You can improve your performance by applying advanced techniques (or ensemble methods) and understand your data trend better. Have you participated in any Kaggle problem? Did you see any significant benefits by doing the same? Do let us know your thoughts about this guide in the comments section below. Beware – interviewer for analytics job is observing you closely! Hats off – Thanks a ton for sharing this. Great work!! Do share any other approach u find. Thanks a lot for sharing. As a beginner, it helps a lot to understand different steps involved before submitting the results. Please never make this post archived. Really a helpful post. I find this just awesome. Thank you so much. Thanks a lot for sharing, it is super interesting to read! What do you usually do when you see that variables are correlated? Thanks for sharing the solution…what are your thoughts on using Rattle for these activities!!! Exactly what I have searched for all this while. Great piece! Thanks a lot. The more I read and practice such exercises, the more I am able to get over the fear of data. Appreciate all the great work. This is a fantastic piece and really appreciated that you shared your work with us. I tried these codes myself for practice and I had one question with regards to the separation of the test and train datasets from the combined dataset can you please explain the arguments in that code (the way I interpreted this piece of code is that as the traning dataset is from 20th day to last day of the month hence the <20 and the same explanation test dataset). When I tried them at my end I see all the combined observations in the train dataset and the test dataset is empty. Please help as I might be going wrong somewhere. Just one thing… where can i download the data for this competition…can u share the link as well. rattle library is not working on latest version of Rstudio . Please suggest alternative. Great article! Thanks for the write=up. Just a small note: In the code that you used to produce year bins, it will put all the data points into either bin 1 or bin 5 and the others will be empty. You should include month <= 3 to avoid this. Ooops, I was mistaken. My apologies. This is what I was looking for … thanks a lot for sharing ..